If only evolutionists would tell the world what they tell each other. In the popular media, in detailed books about evolution and in textbooks a unified front is presented: Evolution is a fact as much as is gravity or the roundness of the Earth. It would be perverse and irrational to conclude otherwise. The scientific evidence for evolution is overwhelming. There are no scientific problems of substance with evolution, just scientific questions about details. Simply put, we know evolution occurred, just not how it occurred. But deep in the bowels of academic libraries, the highly technical research journals tell a different story. The scientific evidences which evolutionists often refer to as so strongly confirming evolution, in fact, do not. Yes there are evidences that are consistent with evolution, but there are also many that are not. In fact there are many evidences which argue against evolution. This is evident in the many fundamental predictions made by evolution which have failed. There is a gaping mismatch between the high claims of evolutionists and the actual science. The genome sequence is an icon of early twenty-first century biology. Genomes of nearly 2000 cellular organisms, and from many thousands of organelles and viruses, are now in the public domain. … At the same time, one cannot but be struck by the diversity of genomes, both across the living world and, in many cases, within genera or species. … Perhaps most unexpected of all is the substantial decoupling, now known in most, although not all, branches of organismal life, between the phylogenetic histories of individual gene families and what has generally been accepted to be the history of genomes and/or their cellular or organismal host lineages. The tree of life paradigm consolidated by Darwin's Origin of Species (1859), but itself arising from a much older tradition of natural history, seems likely to emerge, if at all, from the multi-genome era much more restricted in scope, and subject to many more qualifications, than could have been anticipated a dozen years ago. The decoupling discussed above refers to the many inconsistencies between the traditional evolutionary tree of life, as determined from the visible features of the species, and evolutionary trees determined from the newer genetic data. In fact, not only is there a decoupling between the visible and genetic data, there are substantial inconsistencies within each group. In fact, it is impossible to construct a realistic evolutionary tree using all the data. 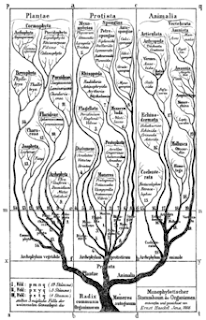 Evolutionists routinely construct evolutionary trees using a select, more cooperative, subset of the data. And even then the resulting trees are unrealistic. That is, they require evolutionary change for which there is no known mechanism. This is true even according to evolutionists who are quite liberal in allowing for speculation. The problem is the species may be similar in some aspects, but not others. So neighboring species on the evolutionary tree may have a great many similarities, but in many cases they have some big differences, which evolutionary theory cannot explain beyond vague speculation. The rapid growth of genome-sequence data since the mid-1990s is now providing unprecedented detail on the genetic basis of life, and not surprisingly is catalysing the most fundamental re-evaluation of origins and evolution since Darwin’s day. Several papers in this theme issue argue that Darwin’s tree of life is now best seen as an approximation—one quite adequate as a description of some parts of the living world (e.g. morphologically complex eukaryotes), but less helpful elsewhere (e.g. viruses and many prokaryotes); indeed, one of our authors goes farther, proclaiming the “demise” of Darwin’s tree as a hypothesis on the diversity and seeming naturalness of hierarchical arrangements of groups of living organisms. The authors of the paper are evolutionists, and so are sympathetic witnesses. They believe evolution is true, and yet even they must admit that the evolutionary tree has problems. Even they admit that the evolutionary tree may be passé, or at least will be subject to many qualifications, restricted in scope and at best an approximation. Between the introduction and conclusion there are plenty of interesting details. For example the paper discusses a particular example species where the evolutionary tree “does not appear to be helpful, or even especially meaningful.” And the paper mentions alternate models such as a ring, network or other topology. To be sure the authors still see much value to the traditional evolutionary tree model. But the paper highlights the fact that this traditional evolutionary tree model is, well, just that—a model. In fact the paper, which is a brief survey, does not discuss several problems with the tree model. For instance, the paper implies that the more complex eukaryotic species fit the evolutionary tree model well. That is not true. There are plenty of contradictions to go around, including in the eukaryotes. And so if the evolutionary tree model is just a model, with warts and blemishes that are not uncommon with scientific models, then where does this leave the evolutionist’s high claims in the popular media, in detailed books about evolution and in textbooks, that evolution is a fact—overwhelmingly supported by the science? There is a wide gap between the truth claims evolutionists make, and the science. Here we looked at the evolutionary tree, but the story is the same in the other evidences for evolution. Over and over, there are the high claims of evolutionists, and then there is the science. Whenever a theory is presented in an inaccurate light, then science loses. Scientists lose the public trust, and students lose the opportunity to learn the real science. This is a great aspect of real science; when an old model becomes obsolete, it can be discarded with a newer, better model to take its place. There are numerous of Darwin's hypotheses which are now known to be wrong because of evidence to the contrary. DNA and the genome project are now shedding light on the problems with a "tree" structure. No problem, just use a different structure to understand the evidence. "Whenever a theory is presented in an inaccurate light, then science loses." That's why it is imperative that theories be able to change and adapt to new evidence. Or, whole parts of a theory must be able to be replaced with new ones to describe the evidence. In this case, the "tree" shape is the part under consideration of being replaced. Name one major part of ID that could be replaced with a completely new model and still describe the evidence. Name one influential evolutionist who says evolution is not a fact, but rather has failed on several predictions and is contradicted by several evidences. Cornelius Hunter you did not answer his question. As an ID advocate I would also like to know a part of ID that could be replaced by a different model? I do recognize the use of the word "major" though...adjectives like that make arguments pointless because they are perceived by what ever the person thinks is "major". The tree of life isn't really "major" to me. But it is interesting that ID advocates have been saying the tree of life is a bad analogy since the beginning. But all this aside...could you answer the dudes question Cornelius? The sine qua non of the theory of evolution is common descent, i.e., nested hierarchies. If common descent is falsified, so is evolution. By the same token, the sine qua non of Intelligent Design is multiple descent, i.e., multiple genetic inheritance. If multiple descent is falsified, so is Intelligent Design. This is an either or situation. If common descent is falsified ID is corroborated. And vice versa. Sure, evoluti9ons can already see the writing on the wall and they've been marshaling new explanations in order to salvage what they can of evolution theory. The new talk in town is evolutionary convergence and virus-enacted horizontal gene transfer. Evolutionary convergence does not have a leg to stand on if multiple genes are found to be multiply inherited in a single species to form non-nested hierarchies. Due to the random nature of mutations, convergence can at most give you a few rough look-alike characteristics, not exact genetic copies. Likewise, the idea that viruses can be vectors for horizontal gene transfers between disparate species can be laid to rest once and for all. For one, it does not preserve the validity of common descent. Second, the complexity of genes is such that they cannot be transferred to a distant species unless the receiving species is deeply modified so as to be compatible with the invading genetic code. The evolutionists are holding a pickle. On the one hand, they cannot defend their position unless they use modern computer technology to analyze the ever growing genetic database. On the other, advances in computer analysis is making it more and more possible to falsify common descent. Stuck between a rock and a hard place. The revolution is coming. Wait for it. And there shall be weeping and gnashing of teeth. I, for one, will be eating popcorn with a grin on my face. Cornelius doesn't answer such kind of questions, ForJah. All he'll do is criticise evolutionary theory and toss the word "design" here and there without further clarification. If I may try to answer the question... I think there isn't yet an ID theory to describe the evidence. And most likely there will never be. The more proposition of life being designed by an intelligent being hardly helps you to describe biodiversity. In order to do that, one should be more specific about how "the designer" works. So, there's nothing to replace yet. But all this aside...could you answer the dudes question Cornelius? The problem is not with ID but with evolution. Our understanding of nature's designs are modified or replaced all the time. From heliocentrism to neuron signal propagation, we're always replacing hypotheses. The problem evolutionists are misrepresenting science. Hence my question. No. Common descent is not the same as nested hierarchies. Common descent means that different organisms descend from the same ancestor at some point. Trees are particular models of common descent in which you only find linage splitting. Networks are the same, except that they allow linage coalescence. Given our knowledge of the biology of different groups of organisms, it makes more sense to use one or the other. Behe begs to differ. That's the sine qua non of special creationism. For one, it does not preserve the validity of common descent. Second, the complexity of genes is such that they cannot be transferred to a distant species unless the receiving species is deeply modified so as to be compatible with the invading genetic code. Utter nonsense. There's no need to undergo "deep modification" to receive a sequence of DNA from distant species. We have much of such junk in our genome. Sometimes transmitted genes can even be immediately "functional". It's easy to make the gene of jellyfish green fluorescent protein work in E. coli, nematodes, and mice. ForJah: But all this aside...could you answer the dudes question Cornelius? The problem is not with ID but with evolution. Sorry ForJah, but the answer to your request is no, Cornelius won't answer the original question. Cornelius doesn't answer questions about his anti-science propaganda. All he does is throw rock from the sidelines, then cuts and runs when the questions start. Pity, but that's just the way it is around here. Common descent is not the same as nested hierarchies. Common descent means that different organisms descend from the same ancestor at some point. Trees are particular models of common descent in which you only find linage splitting. Wow. Science by redefinition, eh? Nested hierarchies are certainly a corollary of common descent. The correct phrase here is not 'different organisms' but 'all organisms'. That has always been a prediction of TOE. Deny only if you're a liar. Behe is not synonymous with ID. Besides, Behe does not do my thinking for me. It is common sense that intelligent design necessarily uses inheritance as a design mechanism. Otherwise, it is not intelligent. And if inheritance is used, it follows that organisms are necessarily classified hierarchically, hence a tree of life. However, unlike evolution, intelligent designers are not constrained by common descent. That would not be very intelligent, would it? now? Utter nonsense. There's no need to undergo "deep modification" to receive a sequence of DNA from distant species. A small sequence, sure. But entire genes that can do things like echolocation? I don't think so. We have much of such junk in our genome. How do you know such "junk" sequences, originated via horizontal transfer and from distant species. Sometimes transmitted genes can even be immediately "functional". It's easy to make the gene of jellyfish green fluorescent protein work in E. coli, nematodes, and mice. Well, it's not that easy since this was done only in the lab, AFAIK. And by intelligent designers, mind you. You don't see this much in the wild, do you? Besides, who knows if this green fluorescent protein does derive from a common ancestor, thus making it very compatible. Furthermore, how complex is the sequence segment that codes for the green fluorescence protein? Not very, I'm sure. By contrast, if, for example, you want to graft a sophisticated mammalian eye onto an invertebrate, you'd better make sure the nervous system of the invertebrate's visual cortex is properly and precisely reprogrammed to accommodate the alien eye. You won't be able to do that by mixing genes together in a blender and see what comes out. You have to do some complex re-engineering design. Louis Savain: The sine qua non of the theory of evolution is common descent, i.e., nested hierarchies. Odd then that Darwin proposed a theory that included its own falsification. He discusses hybridization in Origin of Species, common in birds, rampant in plants. He also discusses why adaptive traits do not always match the nested hierarchy, and that non-adaptive traits are better for determining relationships. Since Darwin, it's been discovered that genetics are particulate, and that there are mechanisms of lateral gene transfer, common in microbes, but also in multicellular organisms. We can often recognize these transfers because they stand out against the prevailing nested hierarchy pattern. Since when have any proponents of ID argued that their ideas about things are the epistemic equivalent of a scientific fact? The fact that evolution, whatever it is, can have major parts of a supposedly rigorously specified "theory" replaced with a "completely new model" which describes the evidence doesn't mean that you're necessarily advancing toward knowledge at all. It's ironic that you seem imagine that you're advancing toward knowledge when your so-called "theories" look more like Rorschach tests. Meanwhile, back in reality... the main reason that people advance toward knowledge is through the use of technology based on intelligent design. I.e. they design techniques and technology based on knowledge and have purposes in mind. Usually inventors like Tesla or the creationist and ID engineers that actually engineer progress in reality instead of imagining things about the past often tend to disagree with Darwinian pseudo-science. Yet ironically, those who are merely imagining Darwinian mythologies of progress and so on often also imagine that this has something to do with progress in knowledge and progress in general. Meanwhile, back in reality... if anything the Darwins generally gave us the eugenics movement, scientific racism and so on while inventors like Tesla left us with wireless communication and so on. That is to say that engineers and inventors often leave us with progress in knowledge in reality based on intelligent design. What did Darwin and Darwinian biologists invent again and how did it progressively benefit people's lives? I'm sure there's a whole host of inventions like Tesla's? How easy it is for evolutionists to change their tune on a moment's notice. You yourself have posted countless comments on this blog forcefully arguing for the sanctity of nested hierarchies. The mendacity is ubiquitous and in-your-face in the evolutionist community. "We can often recognize these transfers because they stand out against the prevailing nested hierarchy pattern." You understand that "recognize" means "assume" LGT because as we "assume" nested hierarchy of traits is due common ancestor. If instead of "common ancestor" you assume an orchard model there is no more LGT. OHHH wait wait wait...I totally understand the problem with asking the question, "What is one major part of ID that could be replaced with a completely new model and still describe the evidence?" The reason this isn't a fair challenge is because we are talking about two theories that already explain the evidence by using the evidence. It's quite circular yes but it's because both theories, being equally unscientific, and based on a presumption. The SAME evidence used for evolution, is the same evidence used for Intelligent Design. ID advocates explain common descent a different way than evolutionists But they use the same evidence. If evidence for evolution changes, then evidence for ID changes. Convergent evolution for example, as Simon Conway Morris seems to believe, is a different way in which to show that perhaps the designers didn't individually design things but structured biology in a way that the best things would develop, predictably. This is how ID COULD change. but in the end, I would say that ID is relatively new to the scientific institution, since it's been suppressed for so long. The reason evolutionary theory has changed so much is because it has had 150 years to be tested and proven. ID has not had that opportunity as of yet. The word to the wise for all ID advocates is...don't think our theory is perfect. Like every theory in science, all of them have their problems both scientifically and philosophically. Louis Savain: You yourself have posted countless comments on this blog forcefully arguing for the sanctity of nested hierarchies. Sorry, but that is incorrect. Nested hierarchies are a mathematical model, just like elliptical orbits are a mathematical model. Nature rarely fits neatly into such structures. Does the Earth travel an elliptical orbit about the Sun? Blas: You understand that "recognize" means "assume" LGT because as we "assume" nested hierarchy of traits is due common ancestor. First things first. Do you recognize the prevailing nested hierarchy pattern for, for instance, vertebrates? Blas: If instead of "common ancestor" you assume an orchard model there is no more LGT. Various mechanisms of lateral gene transfer are observed. They don't disappear because you adopt the orchard model. Also, even in an orchard model, you have nested hierarchies, though with separate trunks, and could still have lateral transfers, both within a given tree, or between trees. Wow. Science by redefinition, eh? Nested hierarchies are certainly a corollary of common descent. The correct phrase here is not 'different organisms' but 'all organisms'. That has always been a prediction of TOE. Deny only if you're a liar.Wow. Science by redefinition, eh? Nested hierarchies are certainly a corollary of common descent. A corollary is not a definition. Do you know what the abbreviation "i.e." you used means? Tree structure follows from common descent + vertical inheritance. Networks follow from CD + vertical inheritance + horizontal inheritance. The correct phrase here is not 'different organisms' but 'all organisms'. That has always been a prediction of TOE. Deny only if you're a liar. Then the correct term you should have used is universal common descent. I didn't say universal just to keep consistency with your own words. And yes, I do think there is UCD, although that wasn't always so clear in the scientific community as you claim. Behe is not synonymous with ID. Besides, Behe does not do my thinking for me. Cdesign proponentists usually agree that common ancestry is compatible with design, even though many if not most would doubt its factuality. It is common sense that intelligent design necessarily uses inheritance as a design mechanism. Otherwise, it is not intelligent. And if inheritance is used, it follows that organisms are necessarily classified hierarchically, hence a tree of life. I have no idea what it means to use inheritance as a design mechanism. Does it imply having species descended from other species? If so, how's that compatible with your sine qua non of ID? However, unlike evolution, intelligent designers are not constrained by common descent. That would not be very intelligent, would it? now? I don't know. It depends on what you were trying to do and what were your constraints. Feel free to flesh up your designer. Much of our genome (~8%) is made of ERVs, which are sequences of "dead" retroviruses. Well, it's not that easy since this was done only in the lab, AFAIK. And by intelligent designers, mind you. You don't see this much in the wild, do you? I wasn't addressing the means horizontal of transmission, but the "deep modification" requirements for receiving a gene. The lab handiwork consisted in picking up the right gene and building the vector, not "modifying" the receiver. Besides, who knows if this green fluorescent protein does derive from a common ancestor, thus making it very compatible. What? If you're making an argument from common ancestry, your premise implies ID is false by your own terms. By contrast, if, for example, you want to graft a sophisticated mammalian eye onto an invertebrate, you'd better make sure the nervous system of the invertebrate's visual cortex is properly and precisely reprogrammed to accommodate the alien eye. I think there's a more than subtle difference between a gene and an organ, but I'll remember that next time I find a mammalian eye in an invertebrate. You yourself have posted countless comments on this blog forcefully arguing for the sanctity of nested hierarchies. Why lie so blatantly and shamelessly? At least have some decency and try to hide your mendacity. And it is not just you, Zachriel, but also Thorton, Paul McBride, Ritchie and others. You have all vehemently defended nested hierarchies and common descent here ad nauseam. But it is not just here. The entire evolutionist community have been doing the same for years. Don't force me to have to go through Hunter's archives to prove you a liar. Geoxus, I'm sorry but you bore me. Joe G: even if there is just a very small chance of a reversion that alone refutes its claims. Zachriel, 2010: That's like saying you can't recognize a pattern zf a couple of letters are out ow place. It's like saying we can't identify the shape of the Earth because it's not a perfect sphere. The correlation may be less than 100%, but still be discernible. Zachriel, 2010: Is the Earth an oblate sphere? Does it follow an elliptical orbit about the Sun? Oh, you shouldn't have expected entertainment from me, Louis. I suggest you go see the upcoming film Prometheus. Revelations from ancient cultures, intelligent design, engineers, and nasty punishment if your search for answers becomes too ambitious... it has it all! I won't miss it. Ridley Scott is one of my favorite filmmakers. I've already pointed out the difference in knowledge created by designers (which is optimally explanatory, rather than non-explanatory rules of thumb) and knowledge created by natural processes (which is aways non-explanatory). Future human designers, or more advanced alien civilizations - should they exist, will have created even better criteria for what logical possibilities to test than we have now. Just as David Deutsch has improved on Karl Poppers criteria for criticizing theories. In other words, your essentially claiming your designer primarily creates knowledge in the form of rules of thumb, as we primarily did before the enlightenment. This is because your claim is based on your conception of human knowledge, which is static. So, it would seem your designer knows less about how to solve problems than we do today. I fail to see how this qualifies as being "more advanced", after all. "First things first. Do you recognize the prevailing nested hierarchy pattern for, for instance, vertebrates?" "Various mechanisms of lateral gene transfer are observed. They don't disappear because you adopt the orchard model. Also, even in an orchard model, you have nested hierarchies, though with separate trunks, and could still have lateral transfers, both within a given tree, or between trees." Yes of course, that is why I say the "tree of life" is an assumption, Nothing discards an orchard model specially when the base of the tree is not a trunk but a net. Well, all hypotheses are assumptions. Let's assume vertebrate life diverged from common ancestors. Just suppose. What would we expect? Well, we would expect a nested hierarchy of characteristics. However, even with perfect bifurcating descent, we wouldn't expect a perfect nested hierarchy. Stochastic processes might stumble on the same pathways, especially if those pathways are limited, such as by natural selection of adaptive traits. So if we hypothesize divergence from a common ancestor, then we would expect a nested hierarchy, and that is what we see. And the exceptions, such as adaptive traits, seem to confirm the hypothesis. A confirmation is not proof, and science doesn't prove but merely supports hypotheses. There's other evidence we might consider, but we might stop here and ask if you have an alternative hypothesis to consider that can explain the nested hierarchy. "Well, all hypotheses are assumptions." But you said it will be insane do not accept common descent. "So if we hypothesize divergence from a common ancestor, then we would expect a nested hierarchy, and that is what we see. And the exceptions, such as adaptive traits, seem to confirm the hypothesis." "Many are coming to believe that early life was characterized by rampant horizontal evolution, replaced in later eons, in many taxa, primarily by a pattern of bifurcating descent." Theory that was alive for decades but denied and derided by darwinist that always said UCLA was as true as gravity. Blas: But you said it will be insane do not accept common descent. No. We echoed Gould who said "In science, fact can only mean confirmed to such a degree that it would be perverse to withhold provisional assent." Blas: they agree with that hipotesis. Blas: Theory that was alive for decades but denied and derided by darwinist that always said UCLA was as true as gravity. Under modern theory, the Last Universal Common Ancestor still existed, but may have been a complex ecology of diverse organisms that themselves sprung from more primitive beginnings. Darwin certainly allowed for the possibility of multiple beginnings, but the evidence to indicate that all extant life shares ancestry. In any case, based on your hypothesis, you apparently agree that vertebrates constitute a tree, so humans share ancestry with fish. Where do you think vertebrates no long fit with the rest of life? "No. We echoed Gould who said "In science, fact can only mean confirmed to such a degree that it would be perverse to withhold provisional assent."" So it is not an hypotesis? it is not an assumption? "but the evidence to indicate that all extant life shares ancestry." "In any case, based on your hypothesis, you apparently agree that vertebrates constitute a tree,"
"so humans share ancestry with fish." Not necessary, it is a working hypotesis, it could be "an astonishing cascade of pararel convergent evolution"
Blas: So it is not an hypotesis? it is not an assumption? A hypothesis is *defined* as a tentative assumption made in order to draw out and test its empirical implications. Okay, from your next comment, you probably mean nested hierarchy. Zachriel: so humans share ancestry with fish. Blas: Not necessary, it is a working hypotesis, it could be "an astonishing cascade of pararel convergent evolution"
Yes, it would be astonishing. Convergent evolution wouldn't arrange organisms into nested hierarchies. Not even sure how that would work. However, a nested hierarchy is a natural consequent of common descent. It's the same pattern the human male chromosome makes over generations. "A hypothesis is *defined* as a tentative assumption made in order to draw out and test its empirical implications." " it would be perverse to withhold provisional assent." Because the hypothesis is strongly supported by the evidence. You seem to think that because it is a hypothesis, it can't also be strongly supported. Strongly supported is a subjective an unscientific observation. How strongly supported it is? How much support make perverse withhold provisional assent for tentative assumption? Common descent is a tentative assumption that explains many observations, with many exceptions and letting many questions, like others hypothesis explains many observations, with many exceptions and letting many questions. Be "be perverse to withhold provisional assent" means that a biologist analyzin the results of an experiment cannot ask himself: Wait a moment! What if common descent were not true? Blas: Strongly supported is a subjective an unscientific observation. Statistics can be used to make an objective valuation. Theobald, A formal test of the theory of universal common ancestry, Nature 2010. Blas: Be "be perverse to withhold provisional assent" means that a biologist analyzin the results of an experiment cannot ask himself: Wait a moment! What if common descent were not true? Not at all. You are more than welcome—and encouraged—to question any finding. However, reasonable skepticism is not the same as contrariness and naysaying. "Statistics can be used to make an objective valuation." Really, how do you evaluate objectivly "strongly support" by statisticss? "Not at all. You are more than welcome—and encouraged—to question any finding." Then "withhold provisional assent" of common descent it is not perverse. Blas: Really, how do you evaluate objectivly "strongly support" by statisticss? We provided you a citation which tests the orchard model, which is a weaker fit to the data than monophyly. "We provided you a citation which tests the orchard model, which is a weaker fit to the data than monophyly." That do not make "strong support" an objective a scientific mean. against the chance that they has a "common descent origin". So the chance of an "orchard model" is the same of convergent evolution. Blas: That do not make "strong support" an objective a scientific mean. times more probable than the closest competing hypothesis." Blas: So the chance of an "orchard model" is the same of convergent evolution. What do you mean by convergent evolution? Why would disparate trees appear to have branched from the same trunk? "That's why it is imperative that theories be able to change and adapt to new evidence. Or, whole parts of a theory must be able to be replaced with new ones to describe the evidence." You allow for the possibility that evolutionary theory might need to change or adapt, and perhaps parts of it might need to be replaced. Look closer. From top to bottom there isn't a tiny piece of the theory that anyone agrees on, except the that the whole with no parts must be true, and that the myriad unknown causes don't include intelligence. It's a like swiss cheese that no one has ever seen, but must be there because everyone can see the holes. It doesn't matter that every causative function that produced every significant feature in every living thing is completely up in the air. It's okay to question them all, just not the central dogma. Check out the Steve Project, cited as evidence of support for evolutionary theory among scientists in general and biologists in particular. Why was there not a shred of detail they could include to which the signers could agree? There isn't so much as a flipper or a leg or a feather or a petal or an organ or hair or on earth or in the sea the specific evolutionary causes of which are described in any detail, let alone agreed upon. But once you have a flipper or a wing, they're lined up around the block to speculate on why the wing on this one is a different color from the wing on that one. Feel free to call the ID kettle black. If I'm going to settle for a vague explanation devoid of observation, details, or science then I'll at least pick one that makes rational sense. DoesItMatter: Look closer. From top to bottom there isn't a tiny piece of the theory that anyone agrees on, except the that the whole with no parts must be true, and that the myriad unknown causes don't include intelligence. The majority of biologists agree that life shares common ancestry, though not necessarily from a single common ancestor, but rather an ancestral population. Many are coming to believe that early life was characterized by rampant horizontal evolution, replaced in later eons, in many taxa, primarily by a pattern of bifurcating descent. You're generally in agreement. No one claims knowledge of the details in general or has a rigorously specified theory but they do claim absolutely certain knowledge of common ancestry or a past progression. In other words, "We don't know how or why it happened but we're absolutely certain that it did. Mainly because we all agree that it did. After all, if we didn't then we'd lose our professional identity as biologists and our claim to certain knowledge. I'm feeling a little overwhelmed with how certain we are about things, aren't you?" Now if only your Herd would demonstrate knowledge at present by predicting a trajectory of adaptation in a group of organisms or the emergence of new forms of life. Or perhaps they could invent things that actually benefit people instead of imagining creation myths that have been used in the past to explain their destruction. What was it that the Darwins invented again, other than illusions of knowledge in the West? Dr. Hunter just posted link of your paper to facebook and several people have already responded favorably. Astronomers treat new findings in their field differently than biologists. Astronomers talk relaxed about it, nobody will loose job or be removed from the elite clubs if they doubt current theory. Recent reports on Dark Matter missing are discussed by mix of laymen (like me) and astronomers in different forums without animosities which are normal in discussions about evolution. I don't think anyone has much of a problem with someone like you, Eugen. For a proper comparison, an unethical scientist would send BA77 or JoeG to "have a chat" with those kind astronomers. Geoxus, I'm just wondering where you personally think I have a problem with modern astronomy? I'm sure biologists are just as relaxed as astronomers when talking amongst themselves about the different processes involved in evolution. I'm also sure that if astronomers suddenly found themselves under attack because the Big Bang theory or the Standard Model had become anathema to Biblical literalists they would be just as upset as biologists. And if those literalists tried to have Biblical accounts of Creation and the nature of the Universe taught in science classes as valid alternatives to current physics and cosmology you would see the same sort of confrontations as you now see over biology. Quite simply because the theory of dark matter is not perceived as a threat to anyone's fundamental religious beliefs - not yet, at least. If it ever happens the astronomers will come running to the biologists for advice on how to handle the attacks on their science. Geoxus, good to see you back. Ian, my problem is not with biology, my problem is with, as this article by Dr. Hunter makes clear, the way the actual evidence is continually kept from public eyes. In astronomy whenever a problem of evidence comes up it is front and center in the public eye, not so with biology, especially if it conflicts with neo-Darwinian dogma. The tremendous incongruities between what neo-Darwinism predicts and what the scientific evidence actually found is gargantuan and to deny that is simply to live in denial. In astronomy any theory which had failed at so many basic predictions would have discarded long, long, ago!,,, As for personal belief, If the evidence supported Darwinian evolution, I would simply become a Theistic evolutionist. But, after going through the evidence, and especially after seeing the deceptive way many neo-Darwinists handle the evidence, I've not had to compromise my core Christian beliefs one iota. I'm glad you're glad I'm back, Eugen. I actually came back because I got a bad cold and had to stay home killing time. Sudoku is not as fun as they say. What's been of your wanderings in Ribosomeland? The correlation between linguistic properties examined and implemented using Automata theory give us a formalistic tool to study the language and grammar of biological systems in a similar manner to how we study computational cybernetic systems. These examples define a dichotomy in the definition of Prescriptive Information. We therefore suggest that the term Prescriptive Information (PI) be subdivided into two categories: 1) Prescriptive data and 2) Prescribed (executing) algorithm. It is interesting to note that the CPU of an electronic computer is an instance of a prescriptive algorithm instantiated into an electronic circuit, whereas the software under execution is read and processed by the CPU to prescribe the program’s desired output. Both hardware and software are prescriptive. Uvula, tuna, igneous rock, trampoline. Uvula sounds like an internal organ :) I will Google it later. Hopefully you will recover soon but not too soon because it's definitely more interesting with good ID challengers around. I'm looking at DNA replication process but Okazaki fragments are giving me headache. It will take some time to figure out the best way to map it. It certainly wasn't designed to be Eugen-friendly. Wouldn't it be nicer if there were an additional DNA polymerase capable of 3'>5' synthesis and an additional enzyme for re-phosphorilating the 5' end in proofreading? Take care of your uvula. Eugen: Astronomers talk relaxed about it, nobody will loose job or be removed from the elite clubs if they doubt current theory. "These findings have important implications for our understanding of gravity? Well sure, if by that they mean how absurd are gravity truth claims. Gravitationists have been caught again. Round up the usual suspects." "Gravitationists will try hard to explain the findings, but don’t expect an objective, theory-neutral, scientific evaluation of their idea." "It would be difficult to find more obvious examples of misrepresentations of science." "At the high school level this gravitationary lie is elaborated." "You know, they still teach the lie of Newtonian Gravitation in high school. Incredible. R"
So you can teach the variation of finches in Galapagos as Newtonia Gravitation and evolution from UCLA trough RM+NS as the dark matter. To carry the analogy, gravity is the observation of objects falling (microgravity), while Newton's Theory of Gravity extrapolates this to planetary motions (macrogravity). That there are anomalies with Newton's Theory doesn't mean that gravity ceases to exist as a phenomena, or that Newton's Theory isn't largely correct. The problem is evolutionists cannot see the immense difference between the two extrapolations of your example. Darwin said, "natural selection is founded on descent with modification: that the characters which naturalists consider as showing true affinity between two or more species are those which have been inherited from a common parent, and in so far, all true classification is genealogical; that community of descent is the hidden bond..."
The problem is that evolutionists have no objective way to determine classification. It all depends on what set of criteria is used to determine classification and even within a limited set there is contradiction. Descent with modification gradually taking hold is not the pattern that the data is revealing. When morphology was all they had, evolutionists could more easily make it fit their storyline. Now they have to invent all kinds of kooky arguments. With Zachriel, it is no longer the "objective" nested hierachy, but the "prevailing" nested hiearchy. He's watering it down. Except, he has no objective measure or basis to determine the status of "prevailing" or not. To quote doesitmatter... "It's a like swiss cheese that no one has ever seen, but must be there because everyone can see the holes." Evolutionists need to stop arguing around all this stuff by asserting their imaginations as scientific fact. Neal Tedford: With Zachriel, it is no longer the "objective" nested hierachy, but the "prevailing" nested hiearchy. It's objective and prevailing. Anomalies have always been known, since Darwin. Neal Tedford: Except, he has no objective measure or basis to determine the status of "prevailing" or not. Sure there is. We tried this once before, but we can try again. Which of these three most closely group together based on an objective view of their panoply of traits; fish, dolphin, cat. Of course, you already know the answer. And when you expand this list, you will find that most animals readily form into nested hierarchies. This isn't something made up. Good that you used gravity as an example. First , astronomers,cosmologists and physicists don't know what gravity is and they are not afraid to admit that. Those who support one explanation do not mistreat, belittle, make fun of others who support different explanation. That is the difference. Eugen: Those who support one explanation do not mistreat, belittle, make fun of others who support different explanation. But there is no one of note in the scientific community who denies that theories of gravity can have explanatory power, or deny that gravity occurs because of anomalies or problems with the prevailing theory, or considers Intelligent Falling a valid scientific theory. Zachriel, no. You're still in the 19th or 20th century regarding the panoply of morphological traits and totally disregarding the molecular data. What I'm saying is that you have no objective measure to deal with so called "anomalies". If your "anomalies" were the norm, you would be blind to it. Everything that doesn't fit your storyline is an "anomaly" and you can not quantify the difference between an "anomaly" and the norm other than if it contradicts your philosophy of descent with modification. You're back to yet another tautology. If evolution was like geometry then a circle, by definition, is actually a square except it has an anomaly of rounded edges or a triangle is actually a circle, except for the anomaly of 3 points. If evolutionists were artists, the color orange is actually red except for the anomaly of yellow. Swampland is a desert, except for the anomaly of water. I'm not exaggerating. For example, the sea squirt classification is 50/50 based on its genome. But, anything that contradicts your storyline is simply an anomaly. That life is an immense mosaic of mixed and matched traits then is one big anomaly for evolutionists. Neal Tedford: You're still in the 19th or 20th century regarding the panoply of morphological traits and totally disregarding the molecular data. The genetic data is certainly important, but it doesn't make the morphological data go away. Are you denying that there is a prevalent and objective nested hierarchy for many taxa? Then the Earth would still be a spheroid, that is, resembling a sphere to within a third of a percent. Yes, I'm absolutely denying that there is a "prevalent" and "objective" nested hierarchy. Molecular evidence often does not square with morphological patterns. Do you deny this scientific fact? "Then the Earth would still be a spheroid, that is, resembling a sphere to within a third of a percent". No, it would still be regarded as a flat square with spheroid anomalies. You have much more than 3% "anomalies" in your nested hierarchy. Alas, if enough anomalies (whatever that would be) are found you could say something like its a cascade of incipient, prevasive, objective nested hiearchies. Imagination = fact for evolutionists. Neal Tedford: Yes, I'm absolutely denying that there is a "prevalent" and "objective" nested hierarchy. Well, let's look at the evidence by trying a few examples. Of these three, which two have the most in common in terms of objectively identifiable traits; fish, dolphin, cat. Are you denying that there is a prevalent and objective nested hierarchy for many taxa? Many taxa... is that sort of rigorous specification like Darwin's original "one or a few" common ancestors? It may have been one... or a few. And based on "reasoning" of this sort it is said that you have an unquestionable form of knowledge, similar to an empirical observation or a scientific fact. It seems that you are not sure how common descent came about or even how "many" times it is common, yet you are certain that every single observation and organism can be explained in terms of an absolutely certain and common knowledge of common descent. Little wonder that so much work has been put into manufacturing a consensus by fusing the notion that common descent is a "natural" way to imagine things to people's professional identities and status in the scientific community. After all, if people were allowed to imagine things in any other way then the illusion of knowledge based on consensus would dissipate. Still waiting on all the verifiable trajectories of adaptation that the singular "theory of evolution" has been used to predict successfully, as well as all the inventions and progress in knowledge that a rigorously specified and falsifiable theory would be linked to. There is no one of note among those critical of evolution, whatever it is, who denies that change/evolution occurs. No one among those who criticize hypotheses of evolution deny that change occurs. ....or considers Intelligent Falling a valid scientific theory. The fact that you equate hypotheses of evolution with the theory of gravity illustrates your ignorance. But as long as you're playing pretend about it, notice how physicists don't seem to be arguing: "I'd imagine that God would never let this object fall where it did. But see how I can imagine that it would fall there, naturally. Now just look at all this overwhelming evidence that verifies my theory!" So then evolution ( change/ evolution) is as much a fact as gravity, correct? There also no one of note who says I believe that gravity violates a core belief of my religion,evolutionary theory does. The physical exceptionality of man, Dembski/ Falk 2012.
mynym: Many taxa... is that sort of rigorous specification like Darwin's original "one or a few" common ancestors? Let's start with a few vertebrates. Of these three, which two have the most in common in terms of objectively identifiable traits; fish, dolphin, cat? mynym: It seems that you are not sure how common descent came about or even how "many" times it is common, yet you are certain that every single observation and organism can be explained in terms of an absolutely certain and common knowledge of common descent. There is no absolute certainty in science, but there is reasonable certainty. mynym: The fact that you equate hypotheses of evolution with the theory of gravity illustrates your ignorance. Actually, Eugen introduced the topic. Excerpt: Yet, in the Chengjian site—which corresponds to the beginning of the Cambrian—researchers have recovered a number of urochordate, hemichordate, cephalochordate, and agnathan specimens, all organisms that would be Pikaia’s evolutionary descendents. Instead of observing the sequential appearance of primitive chordates first, followed by more advanced chordates, the fossil record actually shows the simultaneous appearance of primitive and advanced chordates. What percentage fit,do you have that link? Pikaia is not a vertebrate, nor does it violate the nested hierarchy. In any case, the argument is like asking why there are still monkeys. bornagain77: it is the pattern of morphological disparity preceding diversity that is fundamentally at odds with the neo-Darwinian scenario of gradualism. That is also irrelevant to the nested hierarchy, which concerns the branching pattern. bornagain77: All of the major differences (i.e. the higher taxonomic categories such as phyla) appear first in the fossil record and then the lesser taxonomic categories such as classes, orders, families, genera and species appear later. Of course they do. Given branching descent, earlier branchings encompass smaller branches. It can't be any other way. Well by golly Zach that is some amazing theory you got there, it can explain anything at all without you even batting an eye at severe contortion visited on it. Does it wash windows to? When we address your stated position, you change to another topic. We were discussing whether there is a discernible nested hierarchy among vertebrates. Let's try a few examples. Of these three, which two have the most in common in terms of objectively identifiable traits; fish, dolphin, cat? Keep pushing that rock up the hill,Zach. "The point emerges that if we examine the fossil record in detail, whether at the level of orders or of species, we find' over and over again' not gradual evolution, but the sudden explosion of one group at the expense of another." "A major problem in proving the theory has been the fossil record; the imprints of vanished species preserved in the Earth's geological formations. This record has never revealed traces of Darwin's hypothetical intermediate variants - instead species appear and disappear abruptly, and this anomaly has fueled the creationist argument that each species was created by God." "There is no need to apologize any longer for the poverty of the fossil record. In some ways, it has become almost unmanageably rich and discovery is outpacing integration. The fossil record nevertheless continues to be composed mainly of gaps." "What is missing are the many intermediate forms hypothesized by Darwin, and the continual divergence of major lineages into the morphospace between distinct adaptive types." We weren't discussing gradualism, but the nested hierarchy. By the way, you aren't taking a closer look at anything, but quote-mining. Of these three, which two have the most in common in terms of objectively identifiable traits; fish, dolphin, cat? Excerpt: The oldest rodent fossils yet found in South America have been unearthed along the Ucayali River near Contamana, Peru. The specimens comprise the tiny teeth of mouse-sized and rat-sized animals that lived at least 41 million years ago. How about we ‘open the floodgates’ to the almighty power of Darwinian Evolution and look at Lenski’s Long Term Evolution Experiment and see what we can find after 50,000 generations, which is equivalent to somewhere around 1,000,000 years of human evolution??? Now that just can’t be right!! Man we should really start to be seeing some neo-Darwinian fireworks by 50,000 generations!?! Rats evolve very rapidly, including to cohabitate with humans (Aplin 2011). Well by golly Zach, rapid variation within kind means proof of Darwinian evolution to you. By your definition dog breeding is solid proof of neo-Darwinism. You just got yourself a all purpose theory there that can do no wrong. Okie Dokie now that you got me warmed up for the big show how about changing a rat into a cat??? Excerpt: "Does the report in Wired Science mean that “biologists have witnessed that elusive moment when a single species (of Galapagos finch) splits in two?” Absolutely not." bornagain77: By your definition dog breeding is solid proof of neo-Darwinism. The incredible diversity possible with breeding was an important piece of evidence for Darwin. bornagain77: Okie Dokie now that you got me warmed up for the big show how about changing a rat into a cat??? As the Theory of Evolution doesn't posit that you can change a rat into a cat, not sure your point. Even if you bred a rat to resemble a cat, it would still be cladistically a rat. Don't you understand the basics of evolutionary theory? "Don't you understand the basics of evolutionary theory?" Sure, the basics of evolutionary theory are "no matter what the evidence says evolution done it." bornagain77: Sure, the basics of evolutionary theory are "no matter what the evidence says evolution done it." We just gave you an example of what evolution wouldn't do. And the rock rolled back down the hill. "We just gave you an example of what evolution wouldn't do." I'll give you clear examples of what neo-Darwinian evolution won't do. The main problem, for the secular model of neo-Darwinian evolution to overcome, is that no one has ever seen purely material processes generate functional 'prescriptive' information. To focus the scientific community’s attention on its own tendencies toward overzealous metaphysical imagination bordering on “wish-fulfillment,” we propose the following readily falsifiable null hypothesis, and invite rigorous experimental attempts to falsify it: "Physicodynamics cannot spontaneously traverse The Cybernetic Cut: physicodynamics alone cannot organize itself into formally functional systems requiring algorithmic optimization, computational halting, and circuit integration." A single exception of non trivial, unaided spontaneous optimization of formal function by truly natural process would falsify this null hypothesis. Formalism prescribed, organized and continues to govern physicodynamics." BA, as long as dolphins share more similarities with cats then trout evolution is a fact. Stuff that doesn't fit the evolutionary story is just an anomaly. "Unfortunately, the vast majority of artist's conceptions are based more on imagination than on evidence. But a handful of expert natural-history artists begin with the fossil bones of a hominid and work from there…. Much of the reconstruction, however, is guesswork. Bones say nothing about the fleshy parts of the nose, lips, or ears. Artists must create something between an ape and a human being; the older the specimen is said to be, the more apelike they make it.... Hairiness is a matter of pure conjecture." "But what is the basis for the human evolution thesis put forward by evolutionists? It is the existence of plenty of fossils on which evolutionists are able to build imaginary interpretations. Throughout history, more than 6,000 species of ape have lived, and most of them have become extinct. Today, only 120 species live on the earth. These 6,000 or so species of ape, most of which are extinct, constitute a rich resource for the evolutionists to build imaginary interpretations with." Excerpt: "It is practically impossible to determine which "family tree" (for human evolution) one should accept. Richard Leakey (of the famed fossil hunting family from Africa) has proposed one. His late mother, Mary Leakey, proposed another. Donald Johanson, former president of the Institute of Human Origins in Berkeley, California, has proposed yet another. And as late as 2001, Meave Leakey (Richard's wife) has proposed still another.,,"
Trout are tastier than either cats or dolphins. Neal,maybe you can build an hierarchy according to deliciousness. So what do you think,BA,Neal ? Can a Christian accept evolutionary theory and still be a true ,but deluded;), Christian? Neal Tedford: as long as dolphins share more similarities with cats then trout evolution is a fact. Well, no. You had claimed there was no discernible nested hierarchy for vertebrates. We wanted to take a look at the evidence. You seem to be agreeing that dolphins fit better with cats than trout. As you continue to add vertebrates, you will notice they usually fit very neatly into a nested hierarchy that everyone who looks carefully can agree opon. It will probably also have a complex eukaryote cell structure with organelles and a nucleus containing chromosomes, ingest other organisms for nourishment, exhibit bilateral symmetry, have an alimentary canal and a bony head at one end with an array of sense organs, vertebrae protecting a nerve cord, integument, jaw, ribs, four limbs during at least at some stage of life, neck, neocortex, endothermic, internal fertilization, four-chambered heart, lungs with alveoli and a muscular diaphragm, two eyes, three ear bones in each of two ears, hair or at least hair follicles at some stage of life, sebaceous glands, most will have heterodont dentition, etc. velikovskys: Trout are tastier than either cats or dolphins. Neal,maybe you can build an hierarchy according to deliciousness. Brontosaur tastes like chicken, so it should be in the poultry section of your local grocery. Zachriel, whenever you have a group of items that have varying degrees of similarity, they can be grouped into a "best" nested hierarchy based on certain agreed upon criteria. This is no different than life. Lineaus, the creationists, worked up the first major classification of living organisms. Somehow you think that because of evolution you have this unique and objective hierarchy that is congruent whether you order by morphology or by genome. This is simply is not scientifically accurate. Evolutionists don't make accurate predictions... they find data that agrees with their story and then draw target lines around it and proclaim victory. Did evolutionists predict that some lizards would have placental type reproduction? Of course not. As they said, "In the viviparous lizard Trachylepis ivensi (Scincidae) of central Africa, reproducing females ovulate tiny ∼1 mm eggs and supply the nutrients for development by placental means. Histological study shows that this species has evolved an extraordinary placental pattern long thought to be confined to mammals, in which fetal tissues invade the uterine lining to contact maternal blood vessels. The vestigial shell membrane disappears very early in development, allowing the egg to absorb uterine secretions. The yolk is enveloped precocially by the trilaminar yolk sac and no isolated yolk mass or yolk cleft develops. Early placentas are formed from the chorion and choriovitelline membranes during the neurula through pharyngula stages. During implantation, cells of the chorionic ectoderm penetrate between uterine epithelial cells. The penetrating tissue undergoes hypertrophy and hyperplasia, giving rise to sheets of epithelial tissue that invade beneath the uterine epithelium, stripping it away. As a result, fetal epithelium entirely replaces the uterine epithelium, and lies in direct contact with maternal capillaries and connective tissue. Placentation is endotheliochorial and fundamentally different from that of all other viviparous reptiles known. Further, the pattern of fetal membrane development (with successive loss and re-establishment of an extensive choriovitelline membrane) is unique among vertebrates. T. ivensi represents a new extreme in placental specializations of reptiles, and is the most striking case of convergence on the developmental features of viviparous mammals known." Based on your storyline you would have all kinds of features and functions throughout the mosiac of life evolving independently multiple times, sometimes hundreds of times. What the data shows agrees strongly with very thoughtful human design techniques with basic common platforms, common standards, and features turned on/off, and mixed and matched components. How long can you keep excusing all your anomalies and just accept the data. You need to find an objective metric to deal with your "anomalies". It must be hard to be an evolutionist nowadays. It's certainly not going to get easier as more genomes are sequenced. Neal Tedford: Zachriel, whenever you have a group of items that have varying degrees of similarity, they can be grouped into a "best" nested hierarchy based on certain agreed upon criteria. That's not the case. Designed items almost always have many equally valid categorizations. But you seem to keep avoiding dirtying your hands with actual, you know, organisms. Which of these three most closely group together based on an objective view of their panoply of traits; trout, dolphin, cat. Where would you put a lion? A carp? Also, how do you explain the uncanny ability to predict many features from one feature. What do mammary glands have to do with having three middle ear bones? I understand that according to evolution we are more closely related to the trout than the trout is to the shark. We have a more recent common ancestor. But isn't the anatomy of a trout close to that of a shark? Please correct me if I'm wrong. natschuster: But isn't the anatomy of a trout close to that of a shark? Sure. They each have complex cell structures with a nucleus, integument, bilateral symmetry, circulatory system with heart, alimentary canal, nerve cord, liver, gills, a head with an array of sense organs, jaws with teeth. However, unlike trout, sharks don't have bones, but cartilage. They don't have ribs. And their fins are thick and inflexible lacking the fine fin bones found in trout. Nor do they have a swim bladder. "Syvanen recently compared 2000 genes that are common to humans, frogs, sea squirts, sea urchins, fruit flies and nematodes. In theory, he should have been able to use the gene sequences to construct an evolutionary tree showing the relationships between the six animals. He failed. The problem was that different genes told contradictory evolutionary stories. This was especially true of sea-squirt genes. Conventionally, sea squirts--also known as tunicates--are lumped together with frogs, humans and other vertebrates in the phylum Chordata, but the genes were sending mixed signals. Some genes did indeed cluster within the chordates, but others indicated that tunicates should be placed with sea urchins, which aren't chordates. "Roughly 50 per cent of its genes have one evolutionary history and 50 per cent another," Syvanen says"
If M class organisms have, by definition, components A, B, and C, it is not a prediction to say that an M class organism has components A, B, and C. You have another tautology. Evolution can not predict outside the tautology... that a few M class organisms that live in the sea have E and a few flying M class organisms have E, but other M class sea, land, and flying M class organisms don't. To further complicate the objective classification, a few class A organisms which lay eggs also have E. Also, another class M organism that has components A, B, C also lays eggs like A and has E and component V, like class R organisms. No other class M organisms have component V and no class R organisms have E. We could go on and on about the mixing and matching. If I buy a computer a year from now I predict that it will have a power cord. Isn't that simply amazing how that works? Neal Tedford: If M class organisms have, by definition, components A, B, and C, it is not a prediction to say that an M class organism has components A, B, and C. You have another tautology. Um, no. It's not a tautology if you classify by one characteristic, but there is a correlation with an independent characteristic. Think about it for once. If we looked at the anatomy alone, would we say that the trout is closer to the shark or the human? Trout shared a more recent common ancestor with humans than with sharks. And the crocodile looks more like a turtle than a bird. But it has a more recent common ancestor with birds than with turtles. Is it closer to birds or turtles? Do we follow the anatomy, or more recent ancestry? natschuster: If we looked at the anatomy alone, would we say that the trout is closer to the shark or the human? Only if you take a superficial look. We discussed the distinguishing characteristics above. natschuster: And the crocodile looks more like a turtle than a bird. Turtles are a difficult case, and there is still some uncertainty where they fit cladistically. Let's look at their similarities first. They are eukaryotes, having complex cell structures with a nucleus. They are metazoans, having differentiated cells and ingest other organisms. They are bilaterates with an alimentary canal. They are chordates, having a head at one end with an array of sense organs. They are vertebrates with a nerve cord. They have jaws. They have lungs. They have four limbs. They have amnionic eggs. So we can already place them into a complex nested hierarchy. To maintain a nested hieraerchy, we could simply place them in three sister groups. However, because of common descent, it is generally believed that most divergences are due to bifurcations, though sometimes these bifurcations may be close together and not distinguishable, especially after great lengths of time. In particular, crocodiles have maintained many of their primitive characteristics, while birds and turtles have been reworked by evolution considerably. As we mentioned, turtles are still a matter of some controversy, though no one doubts that they belong in eukaryotes ... vertebrates ... amniotes. It's not even sure if they are cladistically diapsids or not. However, it is thought that they diverged before archosaurs, which is the crown group of crocodiles and birds. This is easier to determine from fossil features, such as the mandibular fenestra and thecodont tooth implantation, than from direct examination of extant organisms. So the trout is objectively closer to the human than it is to the shark? What about the trout, the human, and the lungfish? What about whale, cow and manatee? What about hyrax, elephant and rodent? It seems that it can be difficult to say that the objective nested hierarchy based on anatomy shows common descent. It seems that there are a lot of anomalies that have to be explained away. All organisms are the result of billions of years of evolution. Maybe this will help. natschuster: What about whale, cow and manatee? What about hyrax, elephant and rodent? Not to be rude, but have you tried to read a book on the subject? Is the lung fishes anatomy closer to that of a trout or a human? And a manatee looks more like a whale than a cow, at least to my untrained eye, but it is classified as a proto-ungulate, which makes it a relative of elephants. And the hyrax is also a proto-ungulate, which makes it a relative of the manatee and the elephant. But it looks like a little rodent. I guess the anatomical nested hierarchy works except where it doesn't. Zachriel: Maybe this will help. Well, it looked right in the preview. natschuster: And a manatee looks more like a whale than a cow, ... but it is classified as a proto-ungulate, which makes it a relative of elephants. Try this exercise. Try to find out why biologists have decided that elephants and manatees share a closer relationship with each other than they do with cows. I did some research. It looks like they have similar limbs and incisors. Sirens don't have feet, they have flippers. But we alwsys talk about the panoply of traits. And there is some confusion about whether to pair them ungulates, or to group them with aardvarks and such in the afrotheria. See, the DNA contradicts the morpholgy. That just keeps on happening. natschuster: Sirens don't have feet, they have flippers. Are you saying they more closely resemble fish then? Have you ever studied a fish fin or a mammal fin in detail? natschuster: And there is some confusion about whether to pair them ungulates, or to group them with aardvarks and such in the afrotheria. They're all Afrotherians, if that is what you mean, having branched early from other Eutherians. The closer organisms are related, the more difficult to distinguish, especially if they diverged long ago. Sirens, to my untrained eye, look more like whales than elephants. And hyraxes look more like guinea pigs than elephants. But they are both closer to elephants. And scientists wanted to link paenungukates to ungulates based on morphology, but it turns out that the DNA evidence puts them closer to afrotherians. See, there are so many anomalies and contradictions to the nested hierarchy, that I'm not so sure how well it holds up. natschuster: Sirens, to my untrained eye, look more like whales than elephants. So you would substitute your untrained eye for those of experts? Let's try this. Do you disagree that they are mammals? That mammals nested within amniotes? That amniotes nested within vertebrates? That vertebrates nest within metazoa? That metazoa nests within eukaryotes? natschuster: See, there are so many anomalies and contradictions to the nested hierarchy, that I'm not so sure how well it holds up. The nested hierarchy doesn't have to be perfect to be an objectively distinguishable pattern. Is there somewhere a list of examples that contradict evolution theory? E.g. recently I saw a video what monkeys can do with their foot, so many more features than ours. If man comes from monkey how is it that monkey's foot is more advanced? Many insects have highly developed navigation tool why humans have none? Sharks never have any tooth problem, their broken teeth are replaced by new ones. Etc., etc. To be clear, evolution does not say man comes from chimpanzees, rather they have a common ancestor. I think rm is applying for a position that's already taken. He/she is willing to start out at the bottom and work his/her way up the pyramid. Is that a cat in a hat in your picture? RM: If man comes from monkey how is it that monkey's foot is more advanced? More advanced for what purpose? A monkey's foot is better adapted at performing a particular purpose, while a human foot is better adapted to serve a different purpose. Specifically, the better adapted a feature is, the more hard it is to vary without reducing it's ability to serve that particular purpose. This is the appearance of design, which is the question evolution addresses. In other words, good designs are hard to vary. For example, if an organism becomes highly adapted to it's environment only to have it's environment change dramatically, this could pose a serious problem since the more well adapted it is at one purpose, the more it's ability to perform other purposes is significantly reduced. I'd also note that we can say the same about good explanations, in that they to are hard to vary without significantly reducing their ability to explain the phenomena in question. For example, contrast our modern day explanation of seasons with the ancient Greek explanation for the seasons, which is shallow and easily varied. Persephone, the Goddess of spring, enters into a forced marriage contract with Hades, the God of the underworld. Persephone escapes, but is magically compelled to return to the underworld every year, which causes her mother Demeter, who is goddess of the harvest, to become sad, causing winter. This is in contrast to our current explanation of the seasons, which represents a long chain of hard to vary explanations across multiple fields. The earth's rotation is titled in respect to it's orbit around the sun. A spinning sphere retains it's tilt. Surfaces titled away from radiant heat are headed less. Along, with out theories of photons, the origin of star light (nuclear fusion), etc. If the seasons were not observed out of phase, there is no easy way to vary this observation without significantly impacting it's ability to explain the seasons. Its proponents would have no where go. So, our explanation for the seasons is good not only because it's falsifiable, but because it's hard to vary, which makes the key difference.